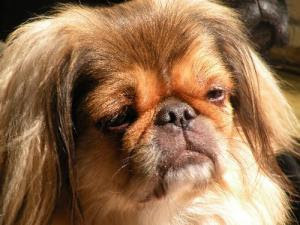 Anyway, our first pekingese was Pookie. Pookie had a litter of puppies, two boys and a girl. Being our first litter, we sold one to a couple in Minnesota and I couldn't resist keeping the two boys and named them Ozzy and Gremlin. Their personalities were like night and day, but Ozzy was the coolest dog in the world! He was so ornery, he was spunky, he was loving, it was amazing! Well, when Ozzy was around 3, I was having problems with him because two of my females would fight a lot when there were puppies and then Ozzy would decide to jump in and he would cause the most damage. I decided that maybe Ozzy and Gremlin needed a new home, but I refused to separate them. As luck would have it, the couple that bought Ozzy and Gremlin's sister had been thinking about getting another peke from me and decided they wanted Gremlin. Their daughter lived in the same town and said she would take Ozzy. It relieved me so much because I was so worried about letting them go. I cried when Ozzy left and a little piece of me knew that no other dog would be able to replace him. About a month later, I got an email from the woman who took Ozzy saying that she had to find him a new home. She said he'd keep running out the front door and she was afraid he'd get hit by a car. So, she turned to PNC Midwest, a pekingese rescue organization that I was familiar with and had donated money to (not much, but I tried.) This probably two years ago. On a whim last night, I looked at the organization's website, and searched for Ozzy. I saw a dog that looked identical, age matched and everything. I emailed the organization and guess what: it IS Ozzy! He's currently being fostered by someone in Wisconsin. We no longer have puppies, so no dogs fight and I feel like it was meant for him to come back to me! I have emailed the woman who runs the organization and asked what it would take to get him back, but I don't know what will happen. I'M the one who got him neutered in the first place, so I think that should count for something, but they have a large adoption fee ($250) and you have to go through a lot of obstacles to get a dog. Plus, he's in Wisconsin right now, so I'm not sure how they would get him to me or how I would get him.